COMPANY PROFILE RPM International Inc manufactures, markets, and sells various specialty chemical product lines, including high-quality specialty paints, protective coatings, roofing systems, sealants and adhesives. RPM International Inc manufactures and sells a variety of paints, coatings, and adhesives. The firm organizes itself into three segments based on product type. The industrial segment, which generates around half of total revenue, sells construction chemicals, roofing systems, and weatherproofing sealants. The specialty segment sells industrial equipment, colorants, exterior finishes, and edible coatings for the food and pharmaceutical industry. Products in both the industrial and specialty segments are sold directly to contractors, distributors, and industrial manufacturers within the construction industry. The consumer segment sells paints, nail care enamels, caulks, adhesives, sealants, and wood stains to home improvement retail stores. The majority of revenue comes from North America. 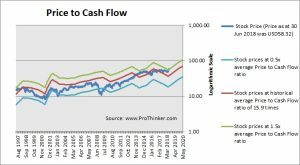 At the price of USD58.32 as at 30 Jun 2018, Rpm International Inc is trading at a Price to Cash Flow Ratio of 24.7 times last 12 months cash flow. This is a 94.0% premium to its historical average Price to Cash Flow Ratio of 12.7 times.